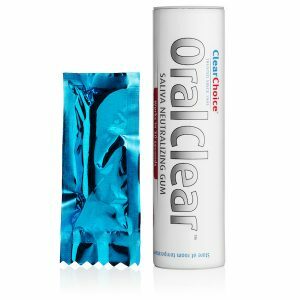 All NEW Clear Choice Oral Clear Saliva Neutralizing Gum. The world’s BEST Saliva solution available! No abstinence period is required! Effective in a blazing fast 30 seconds and will last 30 minutes! One single-use gum per package! ✓ Remove gum capsule from tube, remove wrapping. Save wrapping for used gum. ✓ With lips sealed, bite into gum capsule then allow liquid to spread through the mouth without swallowing. ✓ Once you have chewed on the gum capsule for 30 seconds, your saliva will then be “clear” from all toxins for the next 30 minutes. Click here to read more about saliva testing.